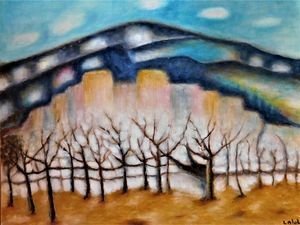 Original oil painting, abstract landscape of densely packed city in a twilgiht glow. On stretched canvas. 27x19 in, 67x47 cm.Unframed. One of Nalan Laluk's most popular themes and styles.